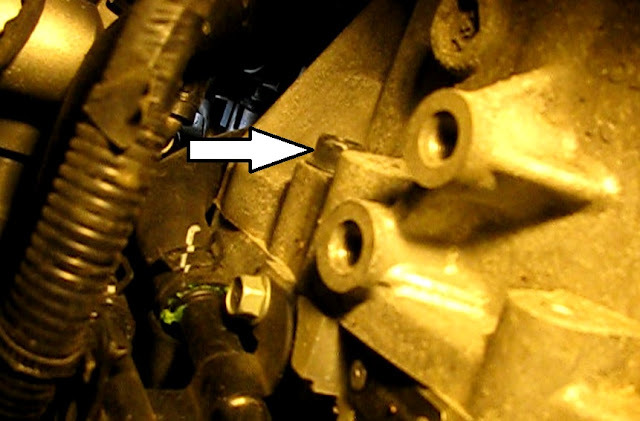 The starter in a 2011 Hyundai Sonata is a challenge to replace owing to it's position high on the engine and obstructions blocking removal. This post will provide some helpful tips in removing and installing this starter. 2) Jack up the front end and put on supports. A good jack and support point are the rails running under both sides of vehicle. 3) From under the car remove the narrow front splash shield. Remove two 10mm hex head screws on the ends and two Philips head panel fasteners in the middle of this piece and pull it out. 4) Remove the large under engine splash shield. This will come out in one large piece. There are seven 10mm hex fasteners. Four are on the front edge and three toward the rear. When all are removed, tug down on the front and pull the entire cover toward the front of the car. 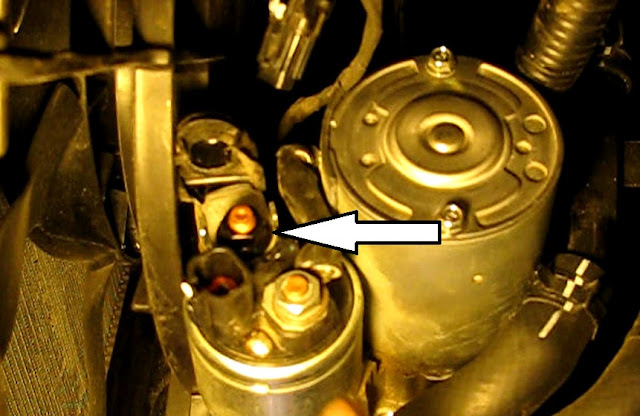 The starter is now visible above the oil filter. One of the two 14mm bolts is accessible from below and the other is best removed from above. It's under the air intake assembly. 5) Remove the intake cover. It unsnaps from four bosses at the corners. 6) Remove the air intake assembly. Loosen the hose clamp holding the air intake to the air intake plenum. Then unsnap the four air cleaner cover clamps. 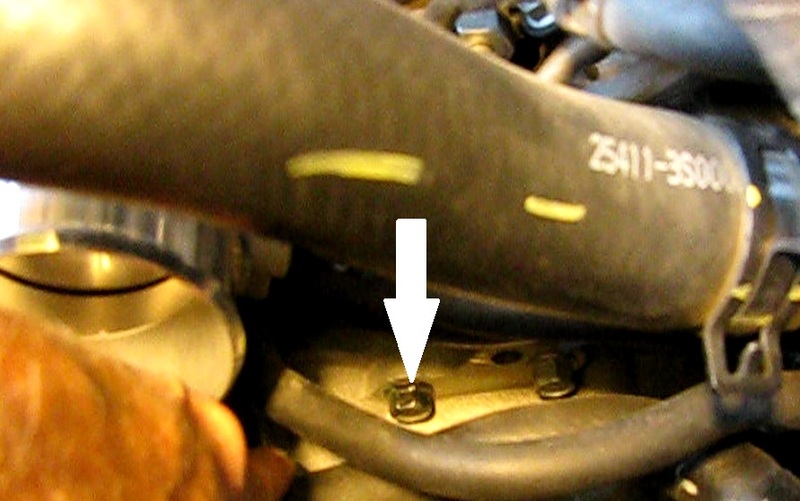 Remove a hose coming in to the left side of the assembly. Then the assembly can be lifted up and set out of the way. 7) Unbolt the starter. The top bolt can be removed from above and the lower from below or above. 8) There are still obstructions to remove. 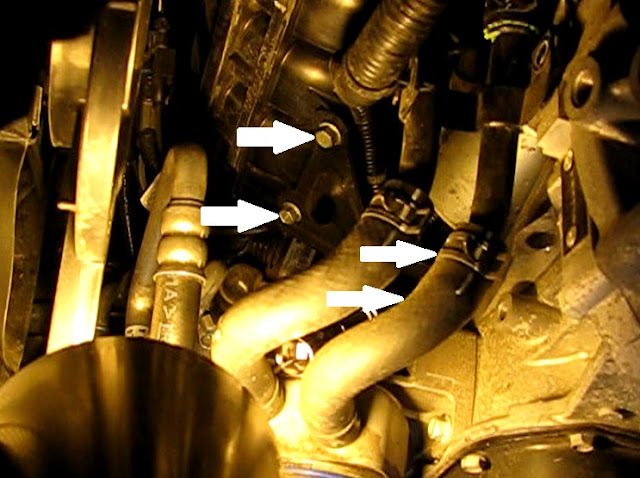 Remove a 12mm bolt holding a bracket that holds the oil lines to the oil filter. 9) Loosen, but do not remove four 12mm bolts holding a black bracket that mounts the intake plenum to the engine. A 3/8" universal worked well for the engine bolts. A 12" extension worked to loosen the plenum bolts. 10) Ease the starter on down and rest it where the wiring can be removed. 11) Unwire the starter. Unsnap the solenoid control wire connector. Remove the 12mm nut from the B+ wire. This connection is under a protective boot. 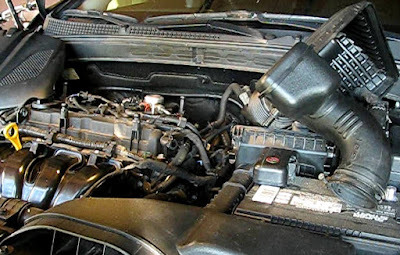 12) Remove the starter from the car. 1) Set the starter up in car and rest it on the oil pump hoses. 2) Wire the starter up. Wire the B+ up with the 12mm nut and seat the protective boot. Plug in the solenoid connection. 3) Move the starter into mounting position and turn in the lower bolt by hand while holding up the starter with the other hand. Turn it most of the way in but not torqued yet. Then start the top bolt and snug it up. Turn both to final torque. I don't worry about a torque wrench on starter bolts. Just cinch them up good. 4) Mount that intake plenum bracket with the same 12mm tools. 5) Mount the oil filter hose bracket with the 12mm socket. 6) Remount the air intake assembly on top. 7) Snap the intake cover back into place. 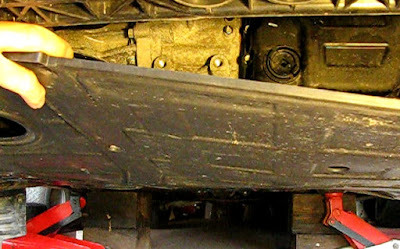 8) Remount the large lower splash shield with the seven 10mm bolts. 9) Mount the smaller from splash shield with the two 10mm bolts and the two panel fasteners. Thanks for the comment. You inspire me to keep them coming! I appreciate that and thanks for having a look at the tutorial. I really appreciate your reading my posts. Glad it helped you on your Sante Fe. I'll keep posting these for the good words from users like you! All I can say is thank you. I had watched some youtube videos but it wasn't until I found this blog that I felt confident enough to take a shot at it. Thanks to your procedure and excellent pictures, I managed to pull it off and saved hundreds! You're very welcome. I'm so glad this blog helped you. The Pittsburgh automotive floor jack comes with a rapid pump. This is what allows you to get to the maximum height with only 3.5 pumps. You will not need a lot of effort to be able to lift your load. Pittsburgh floor jack guide is a one of the best floor jack. Thank you for this! It really helped when my dad and brother were changing out the starter in my Sonata. Very clear, detailed instructions and I love that you listed out what tools would be needed.